Underwater Theme Dark? Whoops. Screwed up on my time slots. Good morning CS and P-90! pouring coffe over the vinyl increases the sound. I always liked this cover. Quite the guilty pleasure. I have missed this bed music. This flaming ball just appeared over the trees and now it's shining light in my eyes. I'm a little scared. Julie in the morning! What a start to my FMU Friday! Good Morning Julie! So good to hear you in real time, live comments and all that. Good morning; this show should wake me up! boo to the flaming ball! Ok I give, how do you activate the GIFs? I set a GIF file as my avatar but I do not see it moving . . . do you? Moving GIF requires a special pledge during marathon, no? No credit card so technically can't pledge. The man in black himself! 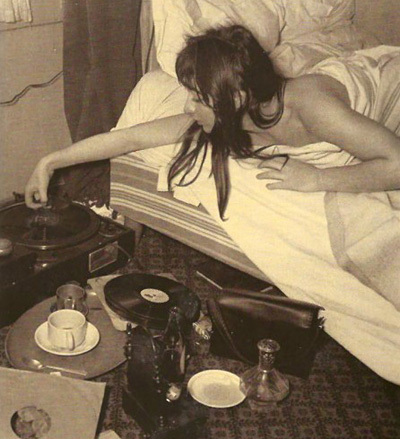 Yeah, that bed music was the first thing I ever heard on WFMU, so it holds a very special place in my heart! Wow Josh that's crazy! When I interviewed Inkubus Sukkubus a few years ago their daughter fell in love with it I had to send them the file. Thanks, Ken from Hyde Park..
yes you should. Joe can fix nearly anything. Mazzy Star is good in the morning. Gloomy cover. I like it. Hey never heard about Poppy Family. It's Terry Jacks's band before he was solo. They can get a little folky for my taste but I really love that song. Thankks for the info Julie! It's troubling my wife that She Brings The Rain is the only Can song you know. I told her that can't really be true. So.... is it? Hmm I think it is. If there's another one I know, I have no idea it's Can. Yes 53 minutes with Julie! Hey what a doggy cover! IMHO you can't go overboard, then you'd have a wacky covers theme show. really enjoying this set. happy Friday. We've missed ya Meghan. Glad there are fill ins. Never a need to apologize for a good handful of cover versions. Meghan was on tuesday morning! I feel this week has spoiled those of us who used to do the Dark and the Park thang...if I can be cheesy. I was! Maybe I can get some more fill ins. Hahaha. Silly talk over music. I like it! Julie, you have the sweetest voice, it's so nice to hear it again! Well, this member of the comments board "B Team" has got to get going as a low laptop battery threatens my feed but it's been such a pleasure listening live again. Great music as always, Julie. Looking forward to the next show. w00t! "Major Tom" a la Plastic Bertrand! Wanted to get on the board before the show ends and tell you how incredible this show is, especially this last set! Thanks, Julie. Till next time. Hope you're back again soon, Julie.